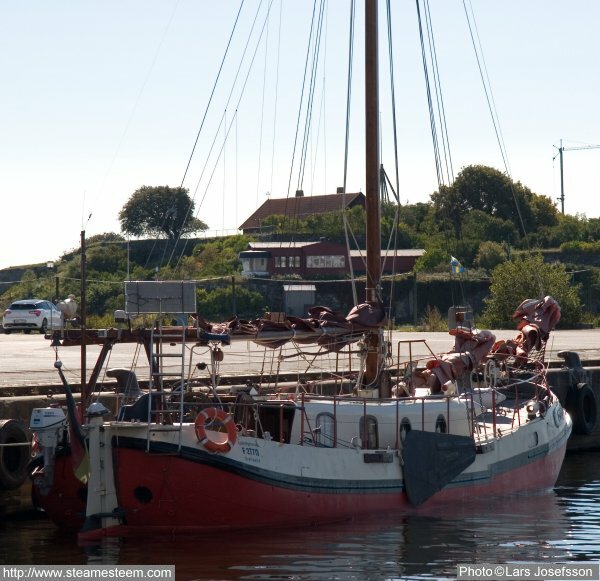 The Tjalk Schildkröte from Greifswald moored in Karlshamn. Tjalk Schildkröte from Greifswald visiting Karlshamn. The LIBRA was badly damaged during World War II and ended up on the Rhine atStürzelberg (a small community between Neuss and Dormagen). From the stern on the starboard side there was a big piece missing; the place was walled up with stones. At some time, new plate was welded in and the location is clearly visible from the inside. Also, there are still welded up bullet holes to be found. 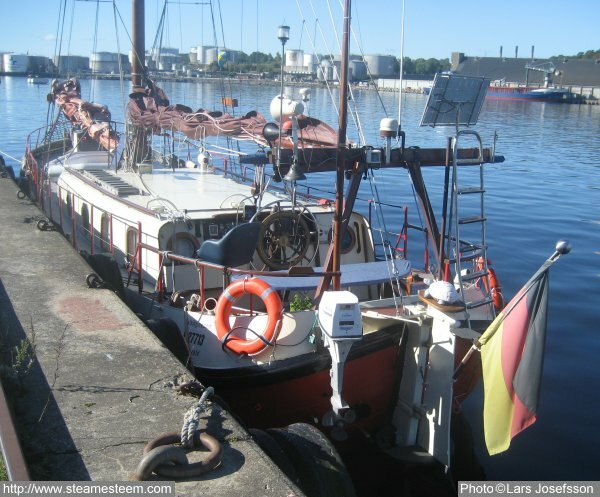 The Tjalk (scow boat) was used at anchor for fishing and sat on the bank of the Rhine for years (maybe 20 years? ), rusting after the death of the fisherman Balthasar Richrath . In the village the ship was called "der Schokker". When I took ownership I was "the man from Schokker". Apart from the hull, there was nothing original. The hold was welded shut. The super structure - built in steel - looked something like a garden house with normal wood windows. Below deck I found a welded live-well used to keep the fish catch alive. For this, the previous owner had removed a number of ribs. Through the open rivet holes Rhine water flowed to the live-well. An engine was never installed (perhaps a motor once stood on deck). Stern tube and engine mounts, as well as rudder and leeboards were missing. On the foredeck an opening was welded shut. From its shape it looks like it allowed a pole with counterweight to be rigged. Thus, one could quickly lower the mast together with the rigging, pass under a bridge and just as quickly, reset the mast and sail on. In the photo, only a part of the welded-closed "opening" is to be seen. The rest disappeared with the installation of the skylight. After the ship was "gutted" (except for the foredeck, which although greatly in need of repair, could be maintained) all that remained was a virtually open hull (not unlike a dinghy) which was heavily rusted where the live-well was installed. This area, I cut away and then welded the hull halves together. The only clue to the surgery is the different heights of the skirting- board at the weld. The shipyard plaque remained. Now the ship, renamed "Schildkröte" (meaning "Turtle" in German), measures 14.9 m. from stem to stern, so that it can be run on German inland waterways with a sportboat captain's license. 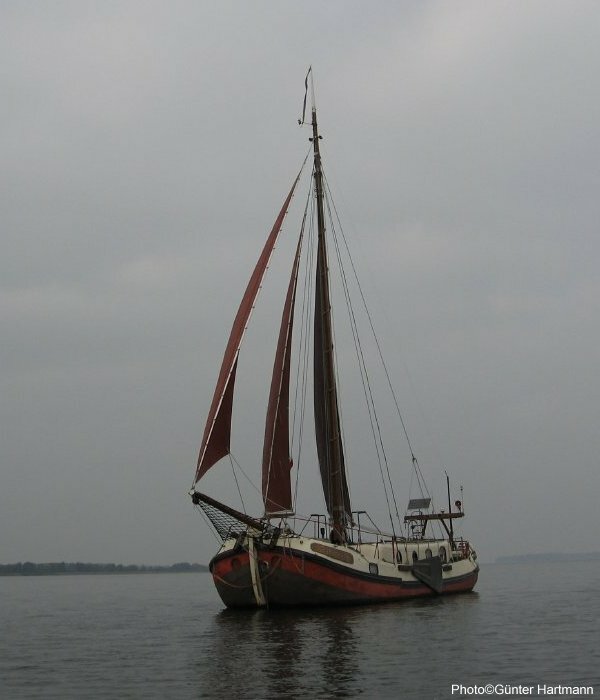 As a pattern and guide for the quasi-new built boat I used the book "Ronde en platbodem jachten" (In English, 'Round a Shallow-water Yacht) from a Dutch author. The aim was to create an easy-to-use sailing ship, with pleasing lines and a spacious comfortable interior; one which can be sailed by two people (me and my wife). Since the hull consists only of curves, this form should also be reflected in the superstructure. So there is hardly any corners. The equipment rack at the stern is unusual on old ships but can't be beat for its functionality. The mast is from glued wood and hollow for weight reasons. The halyards end on the mast, the sheets in the cockpit. 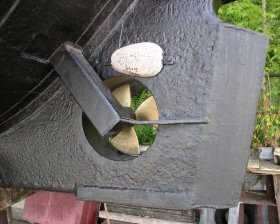 The leeboards and rudder are made of steel, the latter provided with a broad profile, thus it is very small but with large rudder effect. The critical positions of the mast and leeboards originate from plans in the above book and are obviously correct; the ship is balanced on the helm, trims well, can withstand a lot of wind and sails up to 8.5 knots (but the waves shouldn't be too high). For sailing to windward, the engine is run so that excessive drift can be avoided. The Hanomag diesel was built about 1965 and is still running reliably . I have converted it to a quick-start glow plug. It now starts in 10 seconds; before it took up to a minute. 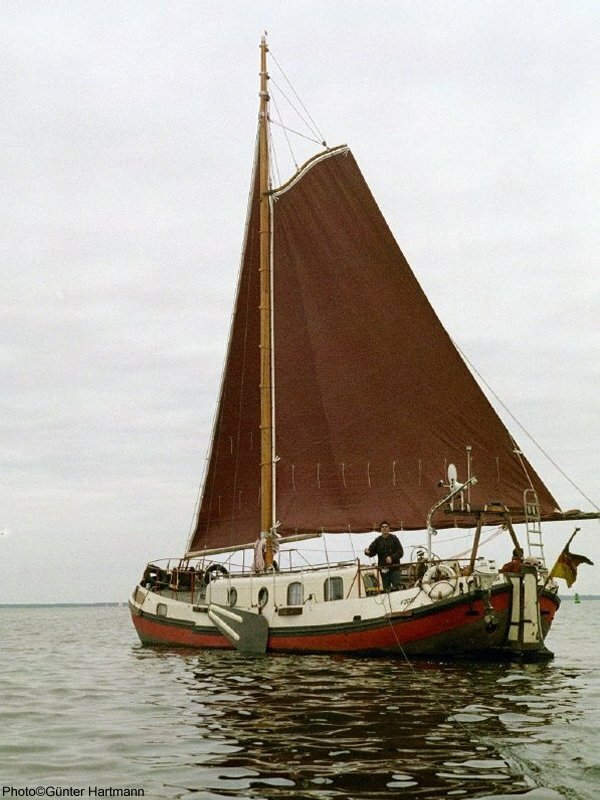 Originally, with gaff rig and no jib ( 05.jpg ) Schildkröte was re-rigged with Bermuda main, staysail and jib. The interior is built partly in solid mahogany and partly from marine plywood. A pot-bellied stove heats the ship when cold weather comes. As pensioners we spend several months each year on board. So far, in 10 years, we've put more than 10,000 nautical miles of the Baltic Sea in our wake.